After taking a week off from watching the movies on the AFI’s 100 Greatest Movies list I am back in action with Titanic, the $ 200 million James Cameron pre-Avatar movie which was expected to sink like the unsinkable ship of dreams. But instead it has been quoted as the most popular motion picture of all time. I have seen it a couple of times, so now when I began watching it again I was feeling quite blasé about it. It’s a movie I like, but not a movie I love. Then something happened when the images of the ship in all its glory started flowing onto the screen – I got once again sucked into the story. Titanic is like two movies is one. One is about the unthinkable tragedy which saw more than 1,500 of the ships 2,200 passengers die, because the ship was thought to be indestructible. As said by James Cameron “The lesson of Titanic is, just don’t go so fast when you’re dealing with that much of power and energy. Give yourself time to turn, because that’s all they did wrong”. The other movie is an epic love story between a girl who has everything except her freedom and a boy who has nothing except his freedom. The love story unfolds smoothly even though at times it’s overpowered by the story of Titanic sinking, which is probably why the screenplay was one of the few categories in which the movie was not nominated for an Oscar. Funnily when you really think about the screenplay, it is nothing new. Love story between two people who are separated by social class – has not that same story been told millions of times? But what makes this movie special is that everything works. The chemistry between the characters has been fine-tuned to perfection. 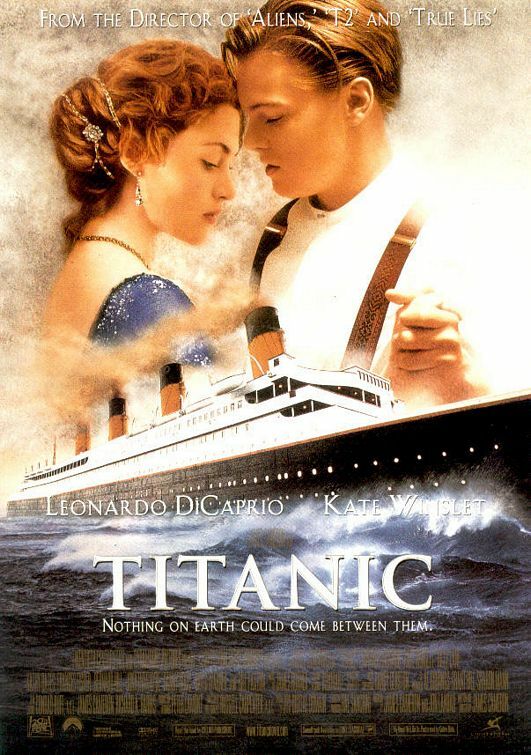 Kate Winslet as Rose and Leonardo Di Caprio as Jack are perfect casting. I have to say that for me Victor Garber as the ship’s builder Thomas Andrews steals the show. He pretty much summons it up with lines like “She [Titanic] is made of iron, Sir – I assure you she can [sink] and she will”. James Cameron is like an all-in-one moviemaking machine – he wrote and directed the movie. He even drew all the sketches used in the movie as Jack’s drawings, including the most famous one of naked Rose wearing the Heart of the Ocean. Damn, if he could act he would have probably acted in it as well. But if you remember his acceptance speech at the Oscars in 1998, where Titanic scooped 11 golden statues, you can be sure it is a good idea for him not to act. 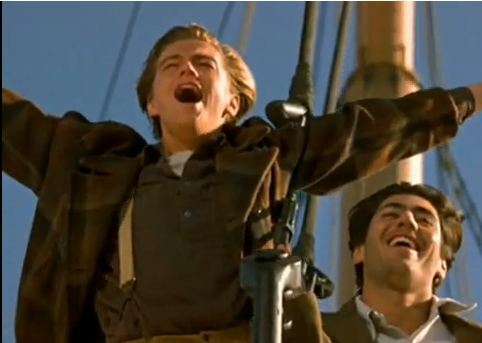 “I am the King of the World” just did not have the same punch as said by Leonardo Di Caprio in the movie. But he sure made one cinematic masterpiece and proved all the doubtful people wrong. The recreation of the sinking of the Titanic is stunning. It makes chilling watching each time. I also found fascinating that footage of the actual Titanic is used in the film. Even though much of the underwater footage was filmed on set with miniature models and special effects. Inarguably the most visually stunning special effect scenes of the movie are the ones when the ship breaks up just before it plunges to the bottom of Atlantic. In the words of the unsinkable Molly Brown: “Now there is something you don’t see everyday”. The level of detailing throughout the movie is also amazing. The sets representing the interior rooms of Titanic were reproduced exactly as originally built, using photographs and plans from the original builders who are still in business. Titanic must have really been something else. I wish I had been there – except for the sinking part; obviously. 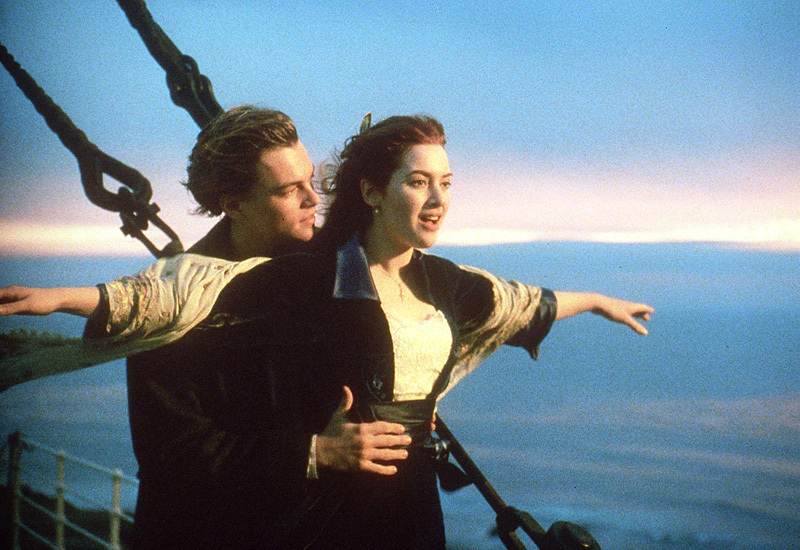 I found the last scene of the movie the most touching – together at last on Titanic. A fitting ending to an epic story, which I am sure, will live on as one of the Greatest Movies ever made – also in my mind.